The National Journal will report on its Thursday edition that in a bold act of defiance against the Obama administration, key Democrats will side with GOP on introducing bipartisan legislation to impose additional sanctions against Iran. President Obama has asked Congress to wait while the administration works toward a comprehensive nuclear deal in the framework of the interim Geneva agreement. The proposed new sanctions would kick in after the six-month negotiating window to reach a comprehensive deal on Iran's nuclear program runs out, or if Iran fails to hold up its end of the bargain in the interim. 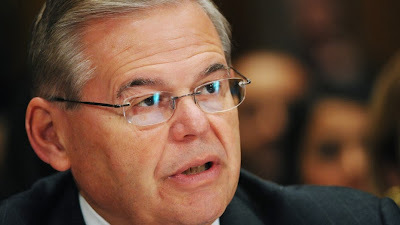 “I am working with a series of members, and I expect we'll have some type of an announcement tomorrow,” Senate Foreign Relations Committee Chairman Robert Menendez, D-N.J., said Wednesday. The administration argues that even the introduction of the bill threatened to undermine the international negotiations. It'll undermine nothing; Iranians have been put in their place and they realize they have zero bargaining power. http://www.youtube.com/watch?v=X1rZCKApZV8 --- Obama explains the Iran deal at Saban forum. No bargaining power! ?,the west whos demand had always been zero enrichment and "all options on the table" had to sit down at the bargaining table and agree to a deal that left iran with thousands of centrifuges enriching and its stock of leu still in place,the west backed down big time and you call this "zero bargaining power"? The american Senat/Senat are only donkeys of AIPAc. This guy looks very ugly. They didn't have to do anything, and are only sitting to hear Iran's surrender. marvelous. An immigrant from Cuban parents is telling us what to do. These guys have a hatered of everything opposit US. Just because US provided them help and refuse to parents from slums of Cuba, they behave as they are more Americans than Anglo-Saxons. The same goes to Jews who emigrated from the getthos of Eastern Europe to US. Typical immigrants mentality. Unlike most who have moved from Western Europe to US and had tradition of civil society, these ones have a hatered of everyone except US. They are doing that because they want to look more Americans than Americans. This only happens inAmerica where a vocal minority has highjacked the whole nation. Don't take me wrong. Neither IRI or Cuba are paradises akin to open prison than anything else. Both have failed their people. But I do have an issue when a bozo from Cuba is telling us what to do! What the hell are you talking about? There are white American senators supporting the bill. Yeah you're absolutely right, troll. They had barely anything to "do", they just had to stop asking for what Obama called "unrealistic demands. ", while he sits on the table with Iran, accept its enrichment right, capabilities and infrastructure, and vetoes any hard-line, AIPAC-driven Congress and Dems-on-a-payroll attempts at botching the ongoing deal. Now you go play war in your room, and let the adults do the intelligent talking here. A good point, Anonymous December 19, 2013 at 5:40 PM. Such people are wannabes, with an identity crisis.